Transgressive Art, why are we as a society so intrested in this culture ? Is it the moral value ? Is it the esthetic value ? Is it art ? Or not ? Or do we evaluate this Art from ? 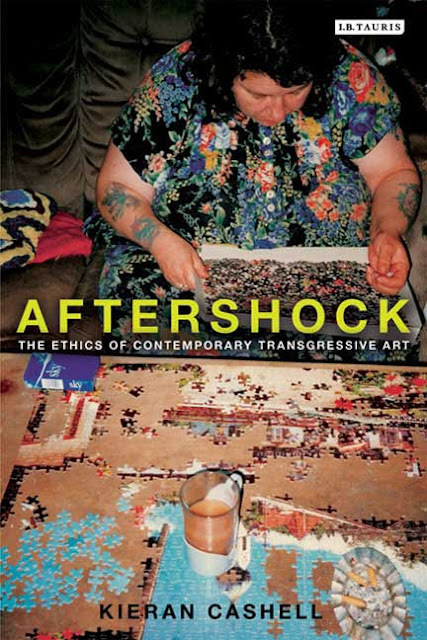 Art critics try to defend « shock » art, but many times it is without thought of the emotional impact. Shock Art creates very strong emotions for every viewer. This is its aim, and it is very important for the viewer to express and deal with this emotion, in some cases there are exceptions on behalf of the viewer. This is human behaviour. Artists who create transgressive art do so by using very strong aesthetic values, on the first glance the viewer see’s the beauty in the art and on futher viewing one realises the shock elements of the piece. My choosen photographer to discuss the controversial aspect of contempory culture is Joel Peter Witkin. Joel Peter Witkin was born sept 13th, 1939 in Brooklyn New York. He is still working today as a photographer in Albuquerque New Mexico. He began as photographer in the U.S. Army. On leaving the Army he began studing photography in New Mexico University. This is where he developed his pictorial style. During his studies, Joel Peter Witkin concentrated a particular photo shoot on taking shots of corpses, dwarfs, transexuals, hermaphrodites and physically deformed people. This established his unique style. A style that got him recognised as an established Artist, and a style to which he still uses today. His images are made up of theatrical compositions using baroque influences to place his subject in his desired composition. The results are symbolic compositions creating mystical icons and really poweful images of trangressive Art. Joel Peter Witkin is entrigued by spirituality and how it impacts the physical world in which we exist, he explores this in many way in his work. His work shows to us a controversial aspect of contempory culture because he talks about taboos of this society. He concntrates on sexuality and physical beauty or some beauty we consider like hideous or ugly. He is looking for a different beauty. His production lead the viewer back to his own strangeness. The work of Joel Peter Witkin for me it’s real true artwork. Before he creates each image he does sketching of his idea and he reinterprerts and reinterprerts his original idea before the final shoot. His photographs are not just simple copies of reality or simple visual reproductions, they are in an artistic process. He made lots of references to paintings from art history like Picasso, Balthus, Goya, Velasquez and Miro. He used imagery and symbols from the past to create his composition. The aim of Joel Peter Wilkin art is to interpret the past art works of history and understand them in order to understand the present. For him his pictures offer us the chance to transcend subject matter, and enter what he calls a world of « Love and redemption ». He creates visual paradoxes that challenge our perception. He says « We are not rational creatures, but subject to our senses ». Joel Peter Witkin claims that his vision and sensibility were initiated by an episode he witnessed when he was just a small child, a car accident that occured in front of his house in which a little girl was decapitated. He also claims that the difficulties in his family were an influence on his work. His mother was catholic and his father was a protestan. Peter wilkin like religion is a large part of his life. The accident that occured outside his home drove him tewards religion, and gave him an understanding of life and death. This accident has changed the course of his life and until today still remaies a very traumatic event for him. « Man without a head »(1993). This photography of a man without a head sitting in the corner, naked just with his socks, is just really scary. You can see some blood on the white floor but no head ! The strange thing that the mide body is facing the spectateur.It is as if he knew we are here.He is waiting for us.He knows that are we looking at him. This man without head looks like he is alive. All of the time when Joel Peter Witkin takes a pictures of dead poeple they look alive. The work of Joel Peter Wilkin consist of photographing people, some are dead some are alive, he concentrates on physical disabilities and strange beauty. 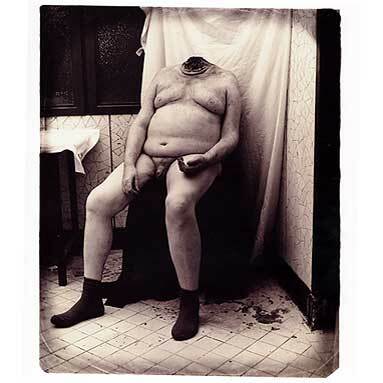 He arranges his subjects to make the viewer belive they are alive, such as « Man without a head ». The question of moral value became stronger in his work especialy when you look at some pictures like « Corpus Medius »(2000), a photograph of half a corpse presented on stage like a portrait sitting, similar to Renaissaince. This composition is similar to « The kiss » (le baiser), a picture of tow heads kissing each other remind us of when in the 19th century poeple organized anatomy theatres like teaching events and public spectacles. The work of Joel Peter Witkin is more moral in comparaison to this practice. Joel Peter Witkin is a really respectful and non-judgemental man, in my point of view, with his subjects. He respects their identity, their faces are rarely visible and he takes a long time to discuss the layout with his subjects before the shoot. Some critics say he is the « most highly collected photographer living today » and some say he is sensationalist and exploitative. Critics who say that have dismissed the possibility of a good reltionship between the artist and his subjects. Also the critics in my opinion missed the meaning of the work of Joel Peter Witkin I believe that Joel Peter Witkin wants to confront the realities of what it means to be alive. I agree with the critic Jonah Samson Dalhousie who says « His attempts to find beauty in unusual places challenges the ideas of early philosophers who believed that the beauty of medicine was found in the cure, and that good health was the only condition worthy of admiration ». This statment is so important in understanding the work of Joel Peter Witkin. 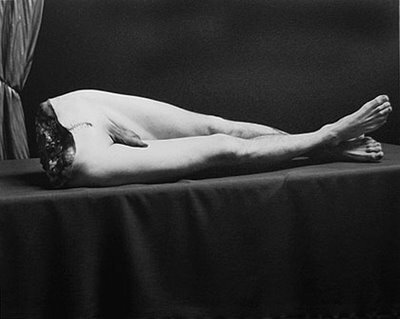 Joel Peter Witkin is not alone in exploring an alternativee vision of the body. Andres Serrano for example photographed corpses as well as statues submerged in bodily fluids like blood and urine. Robert Mapplethorpe has more sado-masochism inspiration. Of course their work is not politically correct and some people say they have abscenities in their work. It is natural to be, shocked by the work of Joel Peter Witkin because he makes links with beauty and horror. Also he shows taboos of todays society. For me his work is really important for our society. I made a strong link, when I see the work of Joel Peter Witkin with the work of Albert Camus, especially « The Myth of Sisyphus ». In this book he says : « To tell the truth, it is a futile question on the other hand, I see many people die because they judge that life is not worth living. I see others paradoxically getting killed for the ideas or illusions that give them a reason for living (what is called a reason for living is also an excellent reason for dying). I therefore conclude that the meaning of life is the most urgent of question. How to answer it ? » I think in one way Joel Peter Wilkin has answerd it with emotion and lucidity. The fact that we all die eventually in my opinion it is absurd to try to normalise people with disabilities, for example to give growth hormones to Dwarf’s or put cochlear implants in for deaf people. Society paints images of normality and would like us to feel disgust or feel pity when we see pictures of dwarf or hermaphrodites or other disabilities. We feel shame, disgust or pity because we think if we are like them, disabled can we continue to live ? And of course we can ! He have so many ways to live life and no one is better than other. That for me is the most important message in the work of Joel Peter Witkin. The image of normality the society would like give to us is wrong. I n my opinion. The work of Joel Peter Witkin gives us a greater understanding about human difference and tolerance. « Man without a head » (1993). « Le baiser » (The kiss, 1982). « Corpus Medius » (2000). Andres Serrano ‘The Morgue’ (Death by Drowning II) 1992. 2009 by I.B. Tauris and Co Ltd.
- Paper writing by ; Charles Mann, current editorial assistant of the photo Review, is a former poet laureate of bucks county, Pennsylvania. He has recently finishes a cycle of poems based on Witkin’s photographs. Witkin » Proceeding of the 10th Annual History of Medicine Days WA Whitelaw- March 2001. - « The Myth of Sisyphus » by Albert Camus, published by poche editions. - Wikipedia, the free encyclopedia online. - Portfolios « Disciple et maitre » published by Marval edition. The word your looking for is Intersex, not hermaphrodites. Hermaphrodite is considered a slur, and is also medically inaccurate. Humans cannot reproduce by themselves.